Patent is an exclusive right of owner which is granted by the sovereign state in order to prevent others from exploiting the patent with commercial purpose in the limited period of time to exchange for publicly disclose invention to allow other people approach the invention. To obtain a patent right, the applicant has to file a patent registration application with the National Office of Intellectual Property of Vietnam (NOIP) and the application will be examined to consider the patentability. After formality accepted, application is published on the Industrial Property Official Gazette. Under Vietnam IP Law and Regulations, Article 112 of Law on Intellectual Property, any third party can file a written opposition with the NOIP to oppose against the grant or refusal to grant a patent at any time during the period from the date of publication to the issuance of a patent. According to Patent practice in Vietnam, there is no independent stage of opposition settlement. The opposition is settled in the substantive examination stage. – The absence of an agreement to file one application only between persons who are entitled to file such patent application in case that there are more than one person entitled to do so. The time limit for third party to submit opposition is counted from patent application published the Industrial Property Official Gazette until prior to the date of decision on the grant of a Protection Title. Furthermore, the third party should be noted that the written opinion on the opposition to patent application must regard the right to register and/or the patentability of the patent application. However, this article is going to relate to the aspect of provision of prior art in the substantive examination stage from the third parties to oppose against patentability of pending application as well as the effectiveness thereof. Effectiveness to provide prior art information in the examination proceeding from the third party will be analyzed based on the impact of this action on the applicant, third party and the authority. As far as we know, invention can change ideas into competitive products which can significantly increase profit for enterprise. When the patent is available the enterprise can use the patent to obtain the remuneration by transferring the rights of use patents to another organization or individual who is able to commercialize them. A patent owner has an exclusive right, he/she therefore is entitled to exploit the patent for 20 years from the filing date. Through the exclusive rights, the owner can prevent the others from using patent for commercial purpose, accordingly decreasing the competition from the others. In other words, if the competing products of the competitor are successful, specially, a stronger competitor will produce the products with cheaper price that is superior in the market. Even any smaller competitive companies can produce the similar products to be sold with lower price because they do not charge any cost of investment for research and development as the patent owner. Besides being competed, the patent owner may be obstructed in the transfer the rights to use patent. Third party may be any organization or individual such as independent inventors, universities, companies or may be a law firm on behalf of for anyone, who have conflicts with the applicant in the patent right. 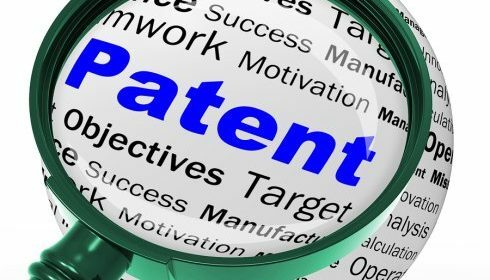 If the third party is a patent owner, the conflict may be the infringement with the protection scope of the granted patent. Otherwise, the third party has produced and prepared to sell products which are not protected as patent, the conflict will occur when a similar products of the applicant is patented. Therefore, it is very important for the third party to actively keep an eye on the market to detect the conflict in patent right. 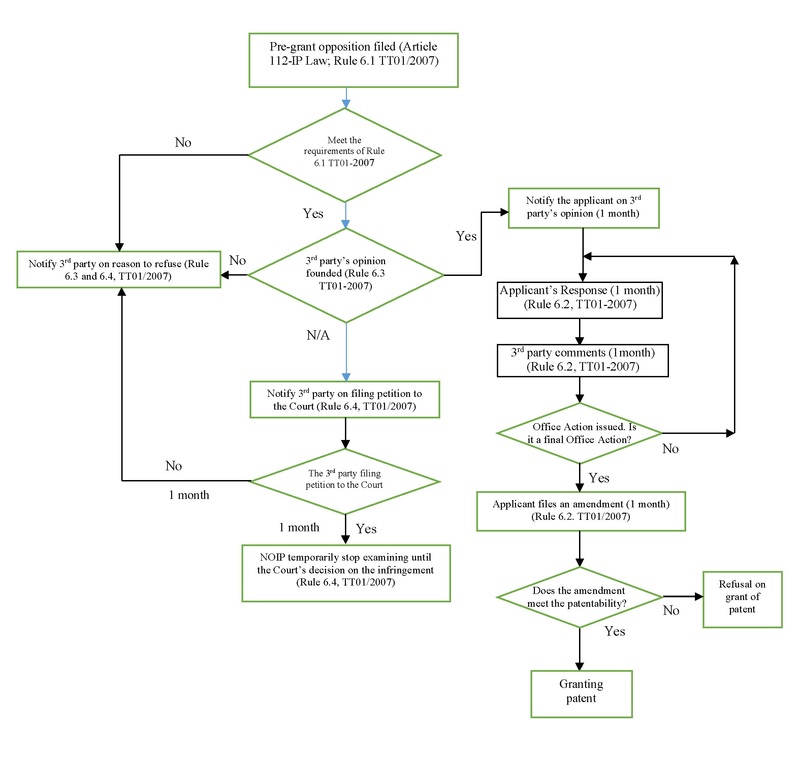 When the third party discovers the conflict with features to his/her technical solution, for example, a similar technical solution has been filed with the NOIP to register a patent application, he/she can submit a written opinion to the NOIP to oppose the patent application as stipulated in Article 112 of Law on Intellectual Property. The opposition of the third party may be successful or unsuccessful. Commonly, there are three following outcomes from the opposition. Firstly, the application is refused to grant patent meaning that the provision of prior art information from the third party proves the patent application not meet the patentability as the most desired of the third party. Accordingly, the third party self-confidently sells products on the market. Secondly, the application is maintained as granted as a result of the opposition is rejected as the prior art is unfounded to prove that the application does not meet the patentability, or the opposition is withdrawn by the third party because of the agreement between the third party and the applicant. Thirdly, the application is maintained as granted after amendment. In other words, the scope of claims of the application is narrowed. In the opposition process, the applicant still submit an amendment of the claim set relevant to the prior art provided by the third party to distinguish the pending application from the prior arts. As the result of this action the opposed application is still granted. The grant of patent for the applicant may be undesired to the third party. However, the amendment of the claim set may be a desire of the third party to narrow the protection scope of the competitor. This may lead to clarify the business scope as well as better delimit the boundaries of portfolios between the competitors in order for the effective investment from the entrepreneurs. From the Open policy, Vietnam has approached and promoted the development of Intellectual Property in order to integrate in the world trade. However, because of being a developing country with young Intellectual Property, it is difficult to ensure the quality of the examination to issue the best patent which can contribute to the technical and economic development in Vietnam. Nothing can assure that a patent office will be able to examine an application precisely if the examination process is required to search prior arts over the world. The provision of prior art information by the third party may be the only ground for the patent office to decide whether or not the pending application with the similar technical features is granted. This leads to the examination is conducted thoroughly. The prior art submission in the examination process not only benefit the third party in the competition but also enhance the quality of examination process in case examiners can not find the prior art having the closest subject-matter to that the examined application. The issuance of bad quality patent will cause excessive burdens on society including the economic impacts such as inefficient resource usage and harm to economic growth. For example, investors will waste time and expense for manufacturing products from the bad quality patent. If a patent is not ensured novelty or inventiveness, it will cause unnecessary prolonged litigation of ownership because of wasting time and money of each of sides. On the other hands, the opposition in the examination process is a challenge to a patentability of patent application. When the patent application stumbles in the opposition on novelty, inventiveness from the third party, it is considered as an opportunity for the applicant to amend the claim set that is relevant to prior arts to distinguish the patent application from the prior arts before the examiner during the application prosecution. This contributes a viable for the patent issued. Accordingly, the prior art submission by the third party can prevent the consequence of infringement or invalidation after grant of patent. In some rare cases in Vietnam, the submission of prior art to the NOIP to prove that applicant is not one who is entitled to file the patent application, the NOIP is unable to confirm whether or not such opinion is compliant, the NOIP shall notify the third party to institute the court proceedings to resolve the matter. If within a time-limit of one month from the date of such notice the third party does not notify the NOIP that the third party has instituted court proceedings, then the opinion of the third party shall deemed to have been withdrawn. If the NOIP is in fact notified by the third party that the latter has instituted court proceedings, the NOIP shall suspend processing of the application to await resolution of the dispute by the Court. After receipt of the Court’s decision, the processing of the application shall continue in conformity with the Court decision. In this situation, the examination proceeding may be prolonged if Court’s decision biases the applicant then the examiner will continue the examination based on the others prior art. In contrast, the examination proceeding is shortened since the success belongs to the third party or the withdrawal of the applicant, the examination is ended thereafter. Because of some limitations in searching for prior art, particularly the infrastructure is being completed, it is difficult for Vietnamese Examiners to conduct searching and examining application on a wide scale. The submission of prior art from the third party is useful manner for patent application examination proceeding. Through the prior art submission, examiners can evaluate patent application more thoroughly to issue high quality patent and remove low quality patent from the patent system. The prior arts submitted from the third party is certainly undesired to the applicant because this causes an obstruction in examination proceeding for the application. It is the not only a challenge to the patentability for the application but also a factor making the time for examination prolonged. As mentioned above, the opposition may be successful or not. In the aspect of applicant, the outcome of the opposition has the following impact on the applicant. – The opposition from the third party is successful, the application is refused to grant patent because of not meet the patentability. The benefit belongs to the opponents. Of course, the applicant suffers a loss of prosecution. – The opposition is rejected by the examiner, or the opposition is withdrawn by the third party, the application is maintained as granted. Accordingly, the applicant has peace in mind to enforce his own patent rights when it is available. – The application is maintained to grant patent after amendment. Generally, the conflict between the applicant and opponent happens when the protection scope of application is broader than the prior arts. Thus, the provision of prior art from the third party aims to revoke the application or at least narrow the protection scope of pending application. In this circumstance, the applicant make a great effort to submit an amendment of the claim set to distinguish the pending application from the prior arts. As the result of this action the opposed application is still granted. The grant of patent for the applicant may be undesired to the third party. However, the amendment of the claim set may be a desire of the third party to narrow the protection scope of the competitor. This may lead to clarify the business scope as well as better delimit the boundaries of portfolios between the competitors in order for the effective investment from the entrepreneurs. Currently, the patent application opposition in Vietnam with third party’s participation in the examination process is still limited, particularly, as of the end of 2014, there are 4447 invention applications and 7 pre-grant invention oppositions (about 0,16% compared to invention applications) filed with the NOIP; as of 31 December 2015, the NOIP has received 5033 invention application and there are 9 pre-grant invention oppositions (about 0,18% compared to invention application filed), as of the earlier August 2016, there are 3091 invention applications filed with the NOIP and there are 3 pre-grant invention oppositions (about 0,097% compared to invention application filed). It can be said that the quantity of pre-grant invention oppositions filed yearly with the NOIP is lower than that of the invention application input and the granted application (1368 patents in 2014; 1501 patents in 2015; 1423 patents in 2016). The reason of low opposition is that in recent years, although enterprises in Vietnam are aware of intellectual property right, however, small medium enterprises have not been aware of watching the market as well as actively search the information of related technical solution filed with the NOIP in order for bringing out timely action to prevent an initial competition stage in which the competitive products has not presented in the market. The monitor of related technical solution should be considered as a strategy of research and development for new technology of the enterprises to avoid a litigation that causes waste of time and money in the future. Therefore, it is necessary to propagate the benefit of prior art submission from third party to promote the clarification of business scope, delimit investment plan as well as improve examination quality for the issuance of the best patent. Moreover, the quality patent will enhance the effectiveness of investment as result in promoting the development of industry and economy for a developing country like Vietnam. – Evaluating the Effectiveness of Third Party Preissuance Submissions – Blogs, IP Law Bullentin- John Penney and Rory Pheiffer.